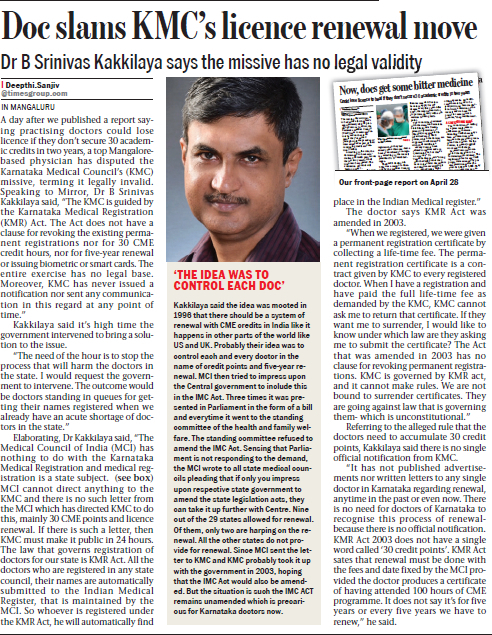 The opposition to the Karnataka Medical Council (KMC)’s plan to enforce renewal of registrations started soon after its first rumblings were heard. The present members of the Karnataka Medical Council were elected on August 31, 2011 and they assumed office by late 2013. In early 2014, KMC started spreading some information, unofficially, about the renewal of registration, tagged with CME Credits. Every CME was also sought to be accredited, by observers appointed by KMC. It was all done informally, through some medical professionals and some professional organisations, through unofficial statements and communications. Although it is mandatory for a statutory organization to issue official communications or gazette notifications or media notifications, they were never issued by KMC. Delegation of IMA, Shimoga, led by Dr. Vani Kori, President, met the stacks Hon’ble Minister of Medical Education, Dr. Sharan Patil and Hon’ble Minister of Health, Sri UT Khader on May 28, 2014 at Bengalooru and apprised them about the problems arising due to the renewal of registration being sought by Karnataka Medical Council; Drs. Ashok Pai and others are also present. In February 2014 itself, some doctors sent RTI queries to both KMC and the Medical Council of India (MCI) regarding the legal basis of such renewal. The replies (RTI reply from KMC, and from MCI) raised more questions than answers. So it was probed further and all the information so gathered was published on this web site in April 2014. The Shivamogga branch of the Indian Medical Association (IMA) took a lead by submitting memoranda to the Hon’ble Chief Minister, Medical Education Minister and KMC itself. But nothing much happened in opposition thereafter. Many CMEs wholesale nba jerseys were conducted Book across the state and doctors clamoured wholesale jerseys for credit points. When KMC announced the dates for renewal, yet again on social media [Document posted on KMC Web site] on 20th April 2016, the doctors of Karnataka started taking notice of the illegalities and started getting organized to question them. MCI DOES NOT specify any time frame from May 2011 to April 2016 for considering credit hours. Such claims made by KMC are blatantly false. KMC cannot make any law. It is governed by the Karnataka Medical Registration (KMR) Act passed by Karnataka Assembly. KMR Act, amended in 2003, DOES NOT specify 30 credit hours in 5 years for renewal. In fact, the words CREDIT HOURS do not appear anywhere in KMR Act. KMC has NEVER issued any OFFICIAL notification regarding renewal or CME credits and therefore whatever is being circulated is legally INVALID and must be ignored. KMC has NOT cited KMR Act anywhere and therefore all messages being circulated have no basis. The MS Word document that is being circulated has NO TITLE, NO DATE, NO NAME/S, NO SIGNATURE, NO SEAL and is therefore invalid. The said document asks some doctors to REVOKE (=CANCEL) their registration rather than to renew! The said document has many statements such as ‘many years’, ‘near future’, ‘few credit hours’ etc, that are untenable. The clause on penalty of Rs. 500 per month, as mentioned in the document, has no legal sanction, is untenable, and unjust. Capturing the thumb impression is fraught with risks and is intrusion into one’s privacy. This is NOT mandated by ANY law and therefore must be protested. There is no provision for CME inspections/fee etc., as accepted by KMC in reply to RTI. As per MCI guidelines, CMEs conducted by local branches of national level organisations and by recognised medical colleges are automatically valid. Therefore, Construction all such CMEs need not have to be ‘inspected’ by KMC ‘observers’. Organisers of all such CMEs can issue certificates mentioning the actual hours of attendance, anywhere from 1 hour and above. Therefore, all doctors of Karnataka must boycott this renewal process until and unless it is done in a legal and transparent manner. Let’s join together and apprise the Govt of the harassment being meted out to us. Within a few minutes, the Whatsapp group got filled and another group had to be created. By evening that day, several groups were created across the state and messages posted on the principal group were shared across the state in no time. By around 6.30pm, some messages, supposedly from members of KMC, defending the decision to renew, were posted into these groups. All such messages were promptly and gently rebutted. Very next morning, KMC published a small advertisement in many major dailies of Karnataka. But this advertisement was not in a befitting format and lacked clarity. Therefore, the Campaign asked all the registered medical practitioners to send a letter to KMC by Speed a Post AD, seeking clarifications and the legal basis of renewal. The draft of this letter was posted on the Whatsapp groups by the same noon and by evening of the same day, hundreds of letters were dispatched to KMC. Some branches of IMA, like the Udupi Karavali branch, erected Help Desks to collect and dispatch the letters from the members. On 28th April, the President of KMC issued a Press statement and that was also rebutted, with all the facts. Within the next 3-4 days, many branches of IMA across Karnataka, like Udupi, Mangaluru, Hassan, Chikkamagaluru, Shivamogga, Dharawad, Hubballi, Ballary, Gangavathi, Raichur, Siruguppa, Bagalkot, wholesale mlb jerseys Mandya, Gadag decided unanimously to boycott the renewal process and by the next week, other branches like Kalaburagi, Tumakuru and others also decided to stay away. On the 7th day of the campaign, when the weekly KMC meet was scheduled, four practitioners, namely Drs. Yogananda Reddy of Ballari, Srinivas Kakkilaya of Mangaluru, Shrikanth Hegde of Shivamogga and PV Bhandary of Udupi, wrote an open letter to the President and members of KMC, urging them to reconsider the decision to enforce CME linked renewal. On that day, KMC decided to waive off the requirement of CME Credit and also to reduce the fee, But this was rejected CME by the campaigning doctors; it was made clear to KMC that it had no legal sanctions for renewal and had no powers to change the rules midway as it pleased, and that any such changes were possible only through enactment by the legislature, followed by gazette notification. By cheap mlb jerseys day 10, many branches of IMA urged the President of the state branch, who also happened to be an elected member of KMC, to convene a special meeting of the Presidents and Secretaries of all the branches of IMA within the state. Such a meeting was called at Bengaluru HQ of IMA on May 8th, 2016, the 15th day of the campaign. This meeting was also attended by the President and members of KMC. All the facts related to the issue were placed before the meeting and after due deliberations, it was unanimously decided that IMA Karnataka State Branch would boycott the renewal of registration. The meet also constituted a 5 member committee, comprising of Drs Srinivas Kakkilaya of Mangaluru, Yogananda Reddy of Ballari, Ravindra Ramaiah of Bengaluru, Vani Kori of Shivamogga and Devaraj Raichur of Hubballi to formulate the strategy and to hold discussions. Following this, the President and members of KMC held discussions with the committee. It was agreed by KMC that renewal process cannot proceed in the absence of supporting provisions in the KMR Act. Considering the arrangements that had already been made by KMC to erect the booths in the various districts, IMA agreed that the practitioners would visit the booths and provide data for updation of addresses, and also provide photo captures. The IMA committee persisted with its objections to capturing of finger prints, and forwarded the legal opinion on the matter to KMC. Following all these discussions and agreements, KMC announced on its web site on May 10, 2016, that the programme of renewal linked with credit points had been changed to Data Renewal and Updation, to be done without any charges. Even after all these, some vested interests have been trying to create confusion and fear in the minds of the doctors. However, KMC’s stated position has not changed, and the registered medical practitioners of Karnataka are opting for only fee updation, and the large majority have stayed away from the illegal renewal of registration. As far as my knowledge goes till 1982 renewal of registration was existing ,but without amending the KMR act the then members of the council decided to issue permanent registration certificates. My question is whether the so called permanent registration certificates issued are legally valid since they were issued against the existing acts and rules. If so why the doctors who were legally well aware accepted the certificates and kept quite till date. They should have immediately refused quoting the existing laws and asked for registration which would have been valid for only one year which would have been correct procedure as per the existing laws between 1982 to 2003. The Council did a simple measure – of collecting annual renewal fee in advance. The registration fee was Rs 15 and annual fee for continuation of the name in the register was Rs 2. Instead of Rs 15, KMC collected Rs 97 and above over the years as permanent registration fee. This Rs 97 was to cover annual fee for 48 years, or if the bank interest is taken into consideration, even @4%, it would be about Rs. 4 per year, double the annual fee for perpetuity. If KMC had issued ‘Permanent Registration’ by collecting only Rs. 15, there would be merit in the argument that such registration was not as per law. But KMC collected more, to cover for annual fee as explained above. Moreover, the IMC Act has no room for renewal and MCI’s suggestions to include such a clause has been ignored by our parliament for 2 decades now. Not only did KMC start this for new registrations, but also allowed the existing practitioners at the time to renew for life and stamped their certificates accordingly. For younger ones, Rs 100 was charged and for doctors above 65, Rs 50 (for 25 years) was charged. KMC has continued to issue permanent registrations. Even to this day, KMC is collecting Permanent Registration fee of Rs 2000. And doctors did not have to object to a measure that helped everyone and that was not against the law. What KMC is doing now is not as per law, Karnataka or Central, and not helping anyone either.